The glorious state in which my carcass resides, New Jersey, and much of the East Coast for that matter is slowly beginning to claw its way back after the devastating effects of Hurricane Sandy, but the need for support still remains. One of the things I love about my home state is the overwhelming amount of zombie fans, but even more than that, the fact that this passion is being used to help raise some much needed support for those suffering from Sandy. As I wandered around the internet, I came across Comic Book Afterlife’s page on Indiegogo. 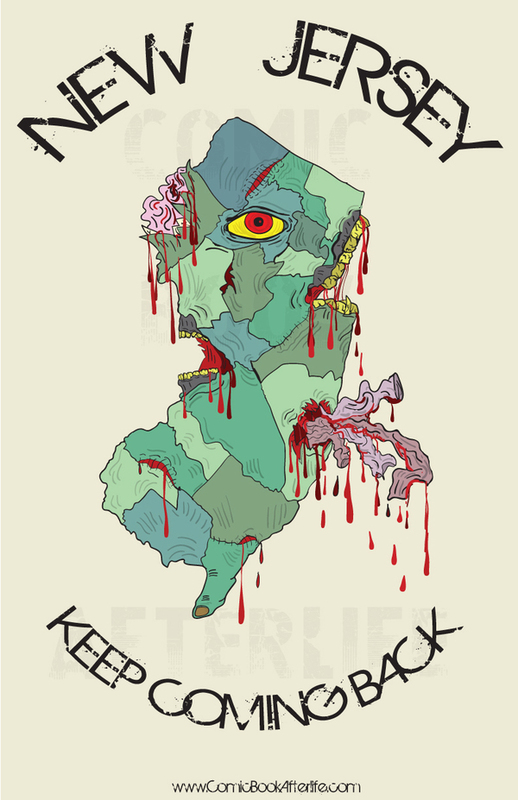 This talented NJ artist is offering up an amazing NJ zombie poster as an incentive to donate…mine is in the mail and I can’t wait. Not that we should need a reward to donate beyond good karma, and boy do I need more of that, but this is a great way to not only help NJ come back, but to also support some local talent. Click the link on the picture below and get your poster today!